Manage your Facebook accounts, pages and groups. Is there a better alternative to Flirt Pro? Is Flirt Pro really the best app in Applications category? Will Flirt Pro work good on macOS 10.13.4? Flirt Pro is your secret weapon to marketing on Facebook. Advertise to millions of people on the largest social network. 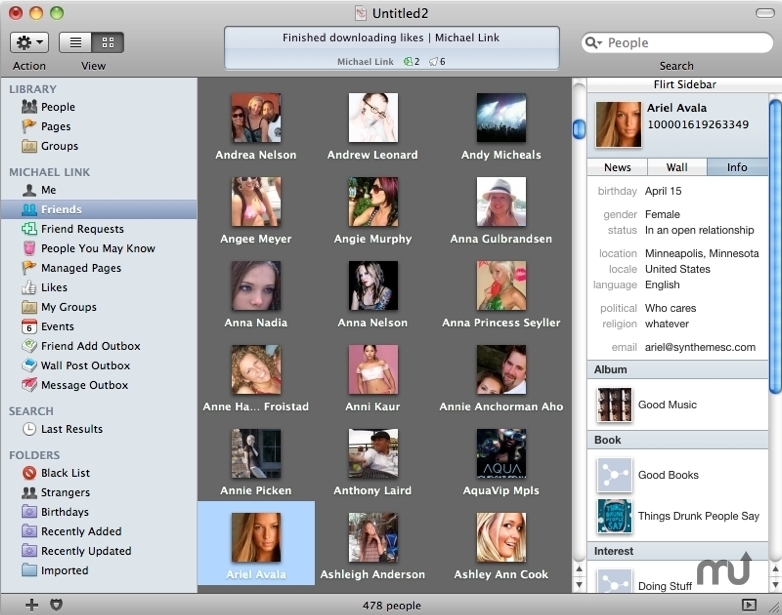 Flirt Pro has all the functionality you love about Flirt, but adds features for serious social networking: mass "Liking," track friend requests and unfriending, export all your friends' contact info, unlimited accounts, and per-account proxy settings. Do you need more likes for your band, a product, event or group? Do you need to quickly invite people to your event? Do you manage several pages or groups and need to increase the number of fans? Then you need Flirt Pro. The best friend adder bot for Facebook. We've designed Flirt Pro from scratch to bring you a truly new and effective solution that is turbo-charged, secure, and exceptional at what it does. Automatically send friend requests to specific targeted groups you define. Share content with people and pages and update your status through wall posts. Send messages to all of your friends or to any specified target market. You can also send messages with attachments to people on Facebook or other email addresses. Quickly create new events sparing no detail and invite all your friends at once. You can make events for your accounts, pages, and groups. Send event invites to anyone, including people you aren't friends with. See what events you've been invited to and respond to them individually or if you're way too busy you can respond to them all at once. Approve or deny friend requests sent to you. With the Pro upgrade you can manage friend requests you've sent and also find out who has unfriended you. Find people by name, location, school or workplace. You can also search for pages, groups, posts, and by object IDs. Automatically see an overview of people you may already know. Get more likes and fans for your pages by being able to invite people you know on Facebook, or from your Address Book contacts or email list. Like (or unlike) pages, wall posts, and even comments. You can even have your pages like other pages. You can join (or leave) groups. If you're a group administrator you can add people to your groups and create group events. Use Facebook as a page and you can like other pages, update the status as the page and create page events. Manage your friend lists, you can make new lists or delete existing ones and edit their content. Switch from another program to Flirt Pro and keep your preexisting data. Flirt Pro can also export text (CSV), XML files, and directly to Address Book. Configure per-account proxy servers using secure proxy server protocols when you upgrade to the Pro version. And it's a real deal, over $500 less than Facebook FriendAdder Pro! Standard ($29.99) and Pro ($89.99) versions available.